The second machine shown, although of a new type as far as this firm is concerned, has been seen in a somewhat similar form in Germany fairly early ДальшеMore>>> in the War, and is in any case, one is informed, more to be regarded as a flying model of a larger machine, a wind tunnel model of which is exhibited. The large machine is to be a two-seater fighter and reconnaissance machine with stationary engine, and the present machine has been built chiefly to test the wings under actual flying conditions. 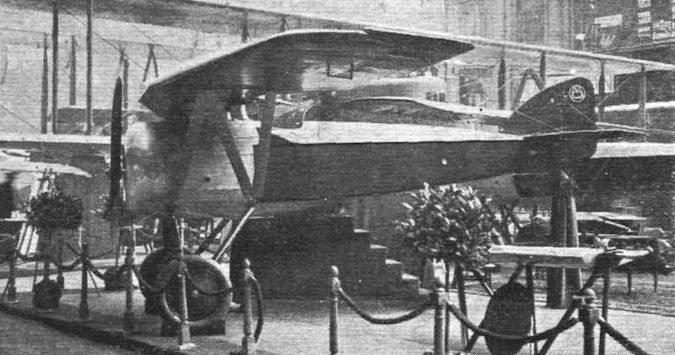 The main feature of the M.-S. type "AU" is the peculiar shape of the parasol cantilever wings. The leading edge is swept back considerably, and the wing, which is built in two halves, is further characterized by having its greatest depth at the points where attach the outwardly raked struts, tapering off in depth and chord to the tips, and in depth towards the centre. One advantage of this arrangement is that the wing spars are more or less proportionate in depth to the bending moment at any point, and from the pilot's point of view the smaller wing depth is of advantage in obstructing the vision to a smaller extent. The machine shown has been flown, but we are informed that few reliable data are available as yet, while various minor points still require modification before the machine is considered entirely au point. The fuselage is of standard type - that is to say, the same as that of the type "AS," while the wings are of the same span and area as those of the type "AI." It has been found that fitting the new wings results in a higher maximum speed and a lower landing speed than those obtained with the ordinary thin wings, but no figures are available as to how great is the increase in the one and the decrease in the other. The Morane-Saulnier type "A.U." has cantilever wings of rather unusual design. The Morane-Saulnier cantilever monoplane is really intended as a full-scale experiment for a much larger machine, which is exhibited in model form on the M.S. stand. 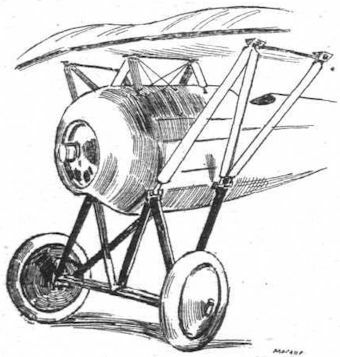 The sketch shows the wing bracing.